Recently, 1st year thIrtham celebrations of srImath paramahamsa ithyAdhi kaliyan vAnamAmalai rAmAnuja jIyar swamy (30th pattam) was completed. Following age old tradition of the mutt, varthamAna (current) swamy - srImath paramahamsa ithyAdhi kaliyan vAnamAmalai rAmAnuja jIyar swamy (31st pattam) refrained from dhivya dhEsa yAthrai during the 1st year of ascending to the throne and stayed at vAnamAmalai dhivya dhEsam for the whole year. After the completion of the 1st year, swamy begins his dhivya dhEsa mangaLAsAsana dhig vijaya yAthrai. 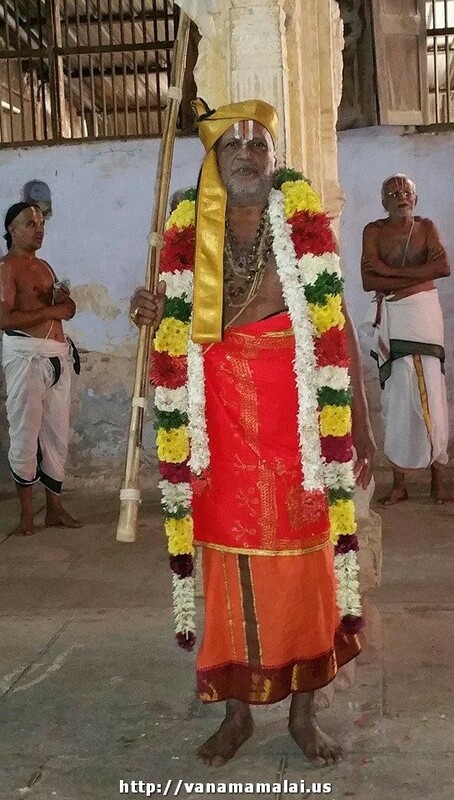 Following the mutt tradition, swamy first performed mangaLAsAsanam at thirukkuRungudi dhivya dhEsam today. Following this, swamy will travel to AzhwArthirungari dhivya dhEsam on 8th to perform mangaLAsAsanam to Adhi nAthan emperumAn and nammAzhwAr. Continuing on he will visit nava thiruppathi dhivya dhEsams on 8th and 9th. During those two days he will rest at AzhwArthirunagari dhivya dhEsam. Request all sishyas and abhimAnis to join swamy in his mangaLAsAsanam dhig vijaya yAthrai.